That phrase, when applied to a beloved product, evokes frustration into the hearts and minds of beauty junkies. The only word to trump it? I’m unsure if that’s the case with MOSS Healing Dew, but it sure seems like it, and I’m utterly heartbroken. Acquired as part of a monthly beauty box, MOSS Healing Dew excited me to no end. It was a product — hell, a line — that I’d been eyeing for a while thanks to its reputation as a brand for acneic skin. The Healing Dew came while I was deep into my search for an oil-free, water-based moisturizing gel to keep my skin hydrated and my pores unclogged. Its true gel-serum consistency (not runny at all) vanished into my skin without leaving it sticky or tacky. Used as a layering product with mists, creams and just a few drops of high linoleic acid oils, MOSS Healing Dew comforted my skin and wore beautifully under foundation. In addition to layering, MOSS Healing Dew was also an excellent mixing agent for my favorite facial oils, creating a whipped emulsion that allowed me to use less facial oil and still get the same level of hydration and moisture. With a sweet yet subtle, rosy scent, MOSS Healing Dew didn’t overpower or compete with any of my other lightly scented facial products. An abundance of hydrosols, herbs, roots, ceramides, vitamins and extracts make up this beloved formula that was so compatible with my skin. Healing Dew also contained niacinamide and ceramides for superior hydration, fully supporting the skin’s protective barrier. These are two ingredients I will continue to look for in future gel-serums, as my skin responded well (think zero dry patches) to this concoction. If your skin is similar to mine — combination and acne-prone, but very prone to dehydration — MOSS Healing Dew was the answer. This gel-serum was specifically designed to reduce inflammation and prevent trans-epidermal water loss (TEWL), which is a constant reason many of us with oily, combination skin still experience dehydration and dry patches. While it seems to be gone (but not forgotten! ), I am excited to see what MOSS has in store for us in 2017. This is a line that brings together the best of nature and science in smart formulations that truly perform. 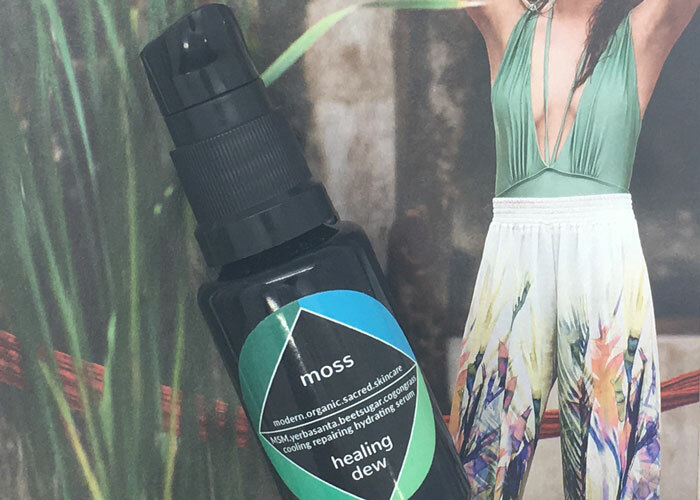 While I’m sad MOSS Healing Dew was my first and only interaction with the brand in 2016, it won’t be the last. I’d recommend anyone with combination, acne-prone, dehydrated skin (any skin twins out there?) check out this line. And of course, I would recommend and repurchase MOSS Healing Dew (and beg for its revival! ), but ya know, discontinued. Have you tried anything from MOSS? What is your skin type? How do you deal with dehydrated, flaky skin? Tell me in the comments!